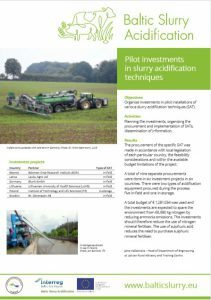 The aim of WP 3 was to plan and organize the investments in pilot installations of various SATs in six countries, taking into account existing conditions, equipment and practices used for field spreading of slurry at the farms in the local area. As real-world applications of SATs in Baltic Sea Region countries, the pilots were at the core of the project. WP 3 also helped orchestrate the realization of the procurement, the installation and initial testing of the SAT, and the generation of a plan for the use of the SAT in order to acquire the operational and other practical data. The specific SATs were procured in accordance with local legislation of each particular country, the feasibility considerations and within the available budget limitations of project. A total of nine separate procurements were done in six investment projects in six countries. There were two types of acidification equipment procured during the process: five in-field and one in-storage. A total budget of € 1,281,034 was used and the investments are expected to save the environment from 66,980 kg of nitrogen annually by reducing ammonia emissions. The investments should reduce the use of nitrogen mineral fertiliser. The use of sulphuric acid will also reduce the need to purchase of sulphuric mineral fertiliser. The report 3.1 Feasibility studies presents issues, from legislation to local conditions, which were considered in each case when planning the installations. The report also describes the investments in detail. Data related to the installation and operation of the investments was collected and used for the environmental and economic analyses done in WP 5. The pilot investments were also demonstrated to local stakeholders. Pilot SATs installed in different countries gave farmers and other end-users the chance to observe the practical aspects of SAT application, as well as the benefits of using SATs, under local conditions, which was aimed at building their confidence in these technologies. The work is also summarized in poster form. The report below describes the procurement of the pilot SAT installations. The report exploring the feasibility of each installation, written before to the investments were made, can be found on the reports page.